Relaxed, trendy craft cocktail and restaurant space with a vintage Florida bungalow vibe and excellent original drinks. Designed like your college friend’s rich aunt’s comfortably appointed beachside bungalow, 27 has a Broken Shaker “pop up” of sorts inside the restaurant. 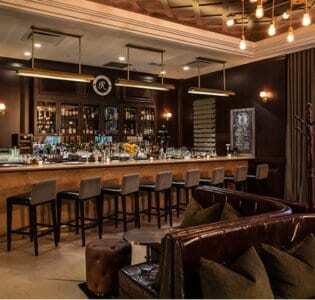 Located inside the Art Deco-themed historic Indian Creek Hotel/Hostel, this enclosed extension of the popular Chicago bar from the award-winning duo “Bar Lab” is adjacent to 27, the hotel’s award-winning restaurant. Lovingly appointed in vintage Florida style, the vibe is convivial, communal and joy-inspiring. Tropically themed cocktails—featuring housemade syrups and infusions and fresh fruit and herbs—are the big draw here. The menu changes seasonally, but you’ll find intriguing drinks like the “Western Tiki”-inspired Remember the Alamo (Olmeca Altos Tequila with “gunpowder grenadine,” lime juice and Bitterman’s Tepache bitters) or the Desert Rose Caipirinha (cachaça, local napoles cactus, sage, lime juice, velvet falernum). Large format punch bowls for groups, like the Dutch Kills (gin shaken with star anise, a fennel seed reduction, citrus and fresh pineapple juice, can be ordered in advance. A handful of crafty-cool beers and wines are also available, along with a small creative bar food menu.